Very good anti inflammatory and against stomach heartburn. 3.0 - Heartburn like crazy!! 5.0 - Actually Works Against my Chronic Heartburn/GERD!!! I'm 29 years old and have been suffering from heartburn/GERD since I was 16, yikes I know. I started with Tums then progressed to 300 mg of Ranitidine every night. The Ranitidine no doubt worked but being on it for well over 5 years just can't be all that good for you. I take 2 caps BID as a general digestion aid. My stomach is torn up from too many years of NSAID use. Unfortunately, due to several joint surgeries and early onset arthritis, I have no other choice but to continue to use them, along with Tagamet to prevent extreme gut pain. Before adding this Ginger Root supplement to my diet, I could not eat citrus or even drink OJ or lemonade without experiencing moderate to severe heartburn. Since adding it, I am able to enjoy an occasional orange, grapefruit or glass of lemonade without adverse effects. Not giving 5 stars simply because the capsules are very large and difficult to swallow. Everything about my transaction was great but these give me heartburn. But that doesn't reflect on the actual product as much as my stupid body. As someone who has used ranitidine occasionally for a number of years for acid reflux and indigestion, I wanted to find a natural product that would work; as prolonged use of acid reducers can cause a plethora of health problems. Ginger has been used as an effective homeopathic remedy for stomach ailments and indigestion for hundreds of years. After doing a great deal of research on natural remedies, I ordered Nature's Way Ginger Root, however I remained a skeptic until I tried it. Several days ago, I took two tablets (the recommended dosage) with a large glass of water and within twenty minutes my heartburn was gone! One suggestion: swallow the capsules quickly because the outside starts dissolving as soon as they touch your tongue. Helps prevent heartburn and stomach upset when used before a meal for my husband and I.
I have a mild belching syndrome (doctor said it was acid reflux-related, but i have no heartburn or other symptoms. when attacks strike--often during exercise or high-stress encounters, i only get this non-stop belching/burping, even on an empty stomach, and a full uncomfortable feeling in the upper stomach. it's embarassing and hard to get things done when this happens!!! i constantly make the hold-in-your-burp-face and am slightly nauseated and then make a hiccup-y noise as i try to keep the burps quiet...i look insane.) i didnt like the side effects of the nexium i was prescribed and started taking ginger root capsules instead, 1 capsule whenever symptoms start. WORKS LIKE A CHARM! sometimes while it's still making its way down my esophagus, i may burp and feel the burn of the ginger come up, it hurts/burns/is really gross, but then it passes, and my burps and uncomfortable stomach are all better! sometimes if im still burp-y 1 hour in, i'll take 1 more capsule and it usually does the trick. i would recommend this to anyone with mild gastro symptoms/discomforts. My husband has constant heartburn and a couple of these capsules takes care of it. Much more convenient than using fresh root. Take these and dont feel any different so who knows? They can give you heartburn if you dont follow the direction. I take is as an add on to my heartburn meds. Not together of course, but, this is a really good remedy if you are looking for immediate relief. I would recommend this product! I have a pretty finicky stomach and get nauseous a lot (as do most emetophobics). A family member bought these for me since I really can't stand the taste of ginger tea or most of the other things to nibble on that help your stomach. I was also pretty skeptical of how well ginger works so I never really used these. Just the other day I woke up in the middle of the night feeling horrible and it just wouldn't go away with anything, peppermint tea, pepto bismol, anything I tried. I took two of these and within minutes, the nausea was almost gone. I'm so glad I found something that's not only less expensive than a prescription, but also seems less harmful. The reason I took off one star is that these are very strong, and it gives me heartburn when I take them. But I'd gladly take that over nausea. Plus it makes your breath smell like ginger. Unfortunately causes irregular heartbeat in some people, me for example, if dosage is too high. Much better than Prilosec et al for reflux / heartburn if you get the dosage right. Ginger root (Zingiber officinale) is well known as a remedy for travel sickness, nausea and indigestion and is used for wind, colic, irritable bowel, loss of appetite, chills, cold, flu, poor circulation, menstrual cramps, dyspepsia (bloating, heartburn, flatulence), indigestion and gastrointestinal problems such as gas and stomach cramps. Ginger is a powerful anti-inflammatory herb and there has been much recent interest in its use for joint problems. It has also been found to combat arthritis, fevers, headaches, toothaches, coughs, bronchitis, osteoarthritis, rheumatoid arthritis, to ease tendonitis, lower cholesterol and blood-pressure and aid in preventing internal blood clots. WOW! Could this be the "Super Supplement of our time? Considering the list of ailments it can treat, I'd say "Yes!". But wait! There's more! I drank a full 8 ounces of water before taking this pill and still got the worst heartburn I have ever gotten! I do not recommend this product to anyone! I will not use these ginger pills or this brand ever in the future. I took this pill to get rid of my nausea during my pregnancy and I got heart burn for about 2 full days. Better than any antacid, or heartburn medication w/o the side effects. Helped me with my heartburn problem....it is a bit spicy when it gets stuck in your throath so I suggest you drink plenty of water when taking the pill. Great and fast acting for stomach aches, heartburn, or any other disturbing digestive issues. Works really well for nausea. Make sure you take it with plenty of water or else you will get massive heartburn! These work fine, but I almost always get heartburn. The Swanson brand works just as well without the heartburn. Fairly priced. Has definitely helped with heartburn for me, and one other family member. I take 2 a day, and he takes 4. This came very fast and we use the Nature's Way brand often. It is affordable and it is a quality product. We have been taking ginger tabs for over a year now and have found it to work better than our acid reflux medication. It is evident when I miss a day, I have horrible heartburn, so I also make sure we have plenty in stock, one ginger a day works for us! I like this product very much. Other than the heartburn it seems to be a good stuff. I give these to my mom for her heartburn they work great and help a lot with the other problems that tend to come with. I had to stop using because it gave me heartburn. I won't purchase again. Not worth it to me. Disappointing because of what I've read up on it. Whenever I eat something spicy, I take a couple of these and I never have any heartburn or stomach issues. If for some reason I get some indigestion, I take a couple of these and it goes away in a half hour. Ginger is great for the GI tract. While popping a couple of Tums could help, it can really mess with your gut microbiotica and thus increase the likelihood of more digestion problems in the future. This is a quick and convenient way to handle digestion issues while helping your GI stay healthy. It says you need to drink lots of water with it, and I tried twice but no matter how much water I drank I would get painful heartburn within half an hour. Didn't seem to help with my sore muscles either (ginger tea is fantastic for sore muscles, but I don't care for the taste). I'm generally skeptical when people make claims that something so simple takes care of a problem they've struggled to control but once in a while something lives up to the claims. I'd been dealing with terrible heartburn and indigestion after almost every meal and tried the standard OTC remedies available. They work for a while but they're expensive and can only be taken periodically. I started taking one or two of the 550mg ginger root capsules a day and within 3 days it almost entirely eliminated my stomach issues. I took it steadily for about 2 weeks and have since dropped down to just a couple times a week. Excellent alternative to pricy pharmaceuticals and it works better. I've been taking these for about a week. And my stomach/heartburn/indegestion problems are so much better. Before I took this product, my stomach was hurting so bad. I started taking one after every meal like the directions states. I have been taking them for about a week. And I feel so much better. Since being on the ginger root, I almost forget to take it after my meals because my stomach doesn't hurt as much any anymore. But I do take at least one a day. Super awesome product for tummy and or heartburn! No side effects, easy to swallow, and price is right! Great for motion sickness as well, or if you are on the water! Kids can take it also! Fast relief! This doesn't work quite as efficiently for me as eating candied ginger, but it's a lot more tolerable to take! It does help reduce stomach upset and bloating, but I usually need to double the dose to get the same effect as a few slices of candied ginger. It can cause heartburn when I do that, though. It is unopened....am afraid of getting heartburn??? I recently read that ginger could be beneficial for heartburn, in addition to its more well known effect on nausea. I will go weeks/months of dealing with heartburn every night, then months where I'm fine. Also, if I get only half a night's sleep and get up early the next day I will get heartburn mid morning as well. I've previously taken Tums, Pepcid AC, and tried the all natural apple cider vinegar that works for some. Tums & ACV did not work for me; Pepcid did but I don't believe its beneficial for digestion long term. Very strong ! Must eat a large meal first of dink 2 huge glasses of water before taking in the morning or you will get heartburn. I started taking 2 pills and I was getting heartburn 70% of the time. I dropped down to 1 pill and same issue. Doesn't matter if it's on a full or empty stomach. My conclusion is that the capsules are cheap and I'll be trying another brand. 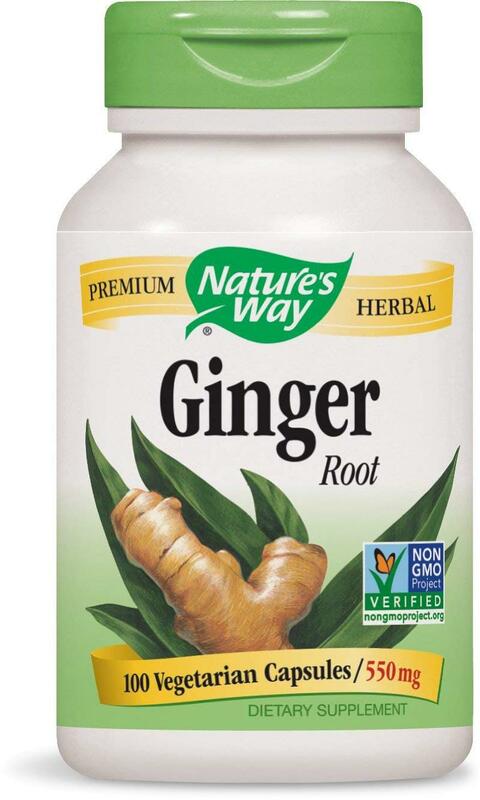 If you have GERD or chronic heartburn, take ginger. Don't waste your money on expensive prescriptions. This stuff works even better. 5.0 - Great, dependable probiotic. It's a fantastic supplement. Definitely helps balance out gut flora - I've found it helps with a variety of problems - nausea, heartburn, gas, even anxiety. Great to take if your diet may be lacking - especially if it consists of mostly processed foods. I have moderate heartburn (and REFUSE to give up my coffee!!) and I'd heard that probotics can help with this. After two weeks of taking the Schwartz BioRecearch Probotics, I have noticed an improvement in my heartburn! These pills are easy to swallow and don't get lodged in my throat like other supplements. Customer service is AWESOME which is so hard to find in this day and age. 5.0 - This Probiotic is Fantastic! I usually don't leave comments, but this stuff is so amazing that I had to. I had my gull bladder removed in 96 and I have had problems with foods ever since. I have gone through so many supplements to try to help my constant constipation, bloating, and gas including other types of probiotics. After trying the other probiotics I bought, I was not convince that a probiotic would help me until I read that not all probiotics are created equal. I did some research and found that there are different strains for different ailments. This one is for different things, but I found that it has helped me with constipation, bloating, gas, heartburn, etc. I take 1 capsule before breakfast and 1 right before dinner and it keeps me feeling normal, not like a blown up balloon. If you have ever had your gull bladder removed, I whole hartedly recommend this probiotic. Even if you haven't and you just want some digestive support, this is the supplement to go with. I have very high hopes for these probiotics. I do like that they don't have to be refrigerated and are not blister packaged. They contain a variety of probiotic strains as well. I was put on omeprazole after heart surgery and continued taking it for a year due to constant heartburn. After reading it might be a factor in reducing good gut bacteria, I stopped taking the omeprazole a few months ago because I was suffering with frequent bouts of pain and gas. In addition to eliminating many acid forming foods and drinks, the probiotics are an attempt to encourage an environment for good gut bacteria and cut back on the tums which replaced the omeprazole. I am seeing improvement with the probiotics and I am relying less on the tums after only a couple weeks of the probiotics. 5.0 - This probiotic works!!! Totally eliminated my severe indigestion, heartburn, and constipation. This is the first probiotic to work for me after trying every probiotic on the market for the past ten years! Nothing to complain about with this product at all. 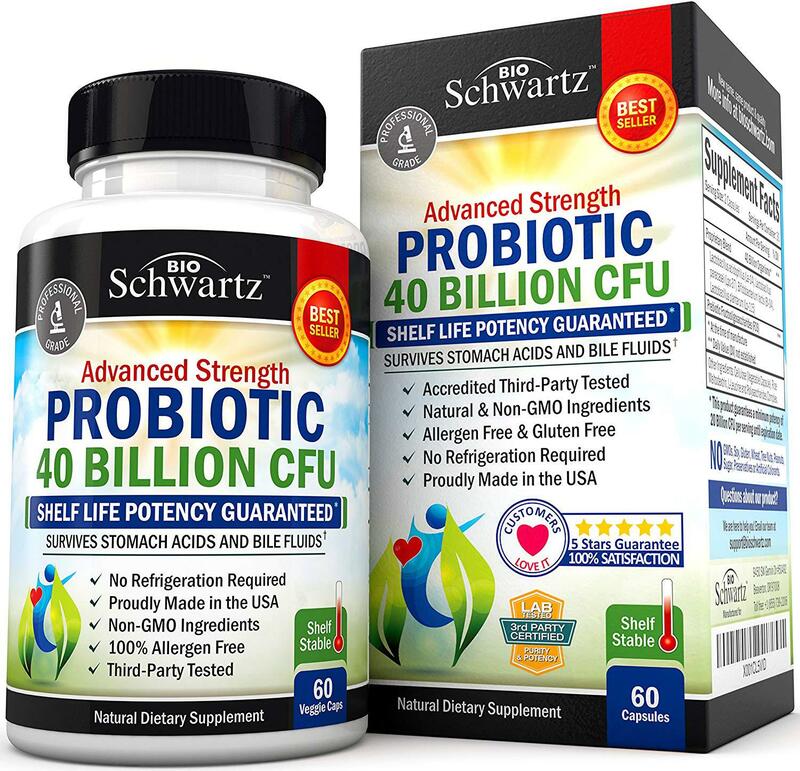 It's been great, I'm always working our my and my husband's digestive health and we find that a good quality probiotic like this one from Schwartz Bioresearch makes a huge difference in how we feel after we eat and in avoiding heartburn and other digestive troubles. We've liked this one a lot. I had a very bad ulcer that was taking a long time to heal. I kept returning to Omeprazole to control continuing heartburn and diarrhea alternating with constipation. I do not want to continue taking Omeprazole because it is being linked with dementia. I have been using this product for over two weeks now. I have regular, normal bowel movements and have not taken an antacid in over a week. I love this product and will continue taking it on a regular basis. It seems to have helped considerably with my heartburn. Everybody around me has been sick with either a cold or flu, I have yet to get sick. I've been using Schwartz Probiotic to get off some medication that my Dr. prescribed for acid reflux. It has been working wonders. I hardly have any heartburn since I've been taking it and I'm almost completely off the medication. Helps with digestion and reduces heartburn. I take it the morning with a protein smoothie and vitamins to jump start my day. Great product! I have lots of food sensitivities and taking this probiotic really made a difference. I feel less bloated after eating and less heartburn. I haven't had heartburn since taking this probiotic. I have real bad heartburn and stomach issues with certain foods and I found that taking this product as directed has greatly increase my ability to eat foods that I could not in the past. It is a awesome Product that has made my body feel so much better. Helps control acid reflux. No longer have to take prescription GERD medicine! Take on empty stomach for best results but seems to work either way. 1.0 - Not for me. This probiotic give me intense heartburn. I have been taking antacids for a very long time, prescription, over the counter etc. I have not had any heartburn since I started taking this product. I have used many probiotics and this is stellar. Please trust me on this product. Amazing. This is an update to this wonderful product. I have allergies, very bad to say the least, however this product has reduced the allergic attacks quite a bit. So far just amazing product. Oh and by the way, it also makes the morning bathroom visit very very good. I can really tell the difference digestively with this product after just a month. Especially less heartburn. I have really noticed better digestion of foods and regularity. I have also noticed I no longer get heartburn. I am so pleased with your customer service. Every time I've had any questions, your staff gets back to me right away with a detailed answer...this means a lot to any consumer. Probiotics have helped me so much with regularity and heartburn. I no longer take Prilosec and I use to be miserable without it. Since taking probiotics, I am also more ‘regular’ which has been a lifelong battle. Bioschwartz Probiotics are fantastic and I absolutely recommend if you have issues like mine! I feel less heartburn, less bloating and gas. I am also much more regular. This probiotic works better than much more expensive products. I have been taking the 40 billion CFU probiotic for about 3 weeks now and am extremely satisfied with the product. I have had GERD problems for years now and recently the symptoms (specifically heartburn) have reduced and noticed bowel movements have improved and are back to normal. I'm not sure how to review this product. I thought I liked the product the first few days. I felt like I was making a healthy decision for my body by adding this probiotic into my vitamin regimen. I think I was going to the bathroom more "regularly". After about 5 days of taking this, all of a sudden I got the worst heartburn I've had in years. It was like battery acid burning in my throat, and it burned like this for a good 4 hours. I took this with my daily multivitamin and with dinner. I cannot say 100 percent that the burning was caused by this probiotic, but I can say that I haven't experienced anything like in years. Not experiencing heartburn anymore, when I had it on a regular basis. My husband and I both take it on a regular basis now. I have suffered from bloating and gas for so many years and tried so many products and recipes and nothing worked like Schwartz Probiotic. It is an excellent product, I'm very happy with the results, after one week I noticed the changes, one capsule in the morning right after breakfast is all I need to make my stomach free of bloating and gas, it also helped me with heartburn. I love this probiotic! Not only has it helped with my digestion (I rarely get heartburn and bloating since taking it) it keeps me extremely regular and also seems to give me energy! I love that it doesn't need to be refrigerated and I can take it with me when I travel. Best probiotic! Helps treat the burn in heartburn. Clear, tasteless, very useful, not gelatinous at all, which I appreciate. but I stopped ordering it because it doesn't prevent anything AND I found that taking betaine, a form of hydrochloric acid, actually stops the problem. Apparently, the research says, there are those of us over 50 who don't make enough stomach acid to close the flap between stomach and esophagus. When the flap doesn't close, the acid that is comes up and creates problems. Acid reducers don't fix it, in this case, and SHOCKINGLY, adding betaine to the situation does. Betaine is not a cure, as I get heartburn if I don't take it, but it is a preventative. 5.0 - Tasteless, pure, can't be without this stuff! I have constipation issues and slow digestion. This aloe juice relieves everything from bloating to gas to heartburn etc...I also rinse my dog with it as he has awful skin itching. Such a pure way to heal many things. LOVE! I've been having acid reflux issues for years with bloating and chest pain (not so much heartburn). At several points in my life the chest pain would get so bad that I would spend hours at night trying to burp and release the air which was miserable. I was prescribed prevacid and despite almost complete cutting out carbonated drinks I would still have flare ups. Had an endoscopy and they said everything looked normal and they just left at that with no changes in medicine or anything. I found myself bringing it up with my Chiropractor and he suggested it might be too little stomach acid among other things causing my problems. One of his recommendation was using Aloe Vera and I picked up a bottle of George's that night (after look at several different ones). With just a 4oz drink each morning I've been able to get my heartburn and indigestion resolve the natural way. Also helps keep me regular. 5.0 - This product is life changing for heartburn! I have been using this product with a probiotic for two years. After suffering daily with heartburn for over 8 years- this has finally "cured" my issues and I no longer have to take any medicine. First of all......I was on a heartburn pill from the Doc. and when I ordered this I thought it Might help at least a little bit. BUT...WOW!!! 5.0 - Couldn't live without this stuff! Very effective for soothing any sort of tummy trouble--from my husband's heartburn to my 9 yr old's constipation to my nausea (I'm 33 wks pregnant & I've used this throughout my pregnancy). Love that it's a natural way to resolve digestive issues, rather than taking an antacid which is not only a temporary fix, but could (and often does) do more harm than good. We always have some on hand in our house. Tastes just like water so even my 9 yr old doesn't mind drinking it! I had been taking omeprazole magnesium for a few months off and on. Every time I stopped the GIRD would return in a week. I read the medicine can increase the chance of stomach cancer so I tried Aloe Vera water. Within in a day or so I felt the difference. It's been a number of months and I haven't even had an incident of mild heartburn since I started drinking an ounce in the morning and evening. I also find it helps when I start to get a dry or sore throat. I also use it to rinse my eyes when they get tired from wearing contacts. It seems to eliminate the redness. I will probably be taking this every day the rest of my life. 5.0 - Throw out the Tums! Regularly had a tub of Rolaid’s on my nightstand, now I pour about a 4 oz glass of George’s and keep that next to my bed instead! Helps will all things! Heartburn, indigestion, upset tummy... anytime I wake up with uncomfortable digestion issues I just reach for my glass sip on it, a few deep breaths, and I’m able to get right back to sleep. It’s my favorite product by far. Also helps will occasional overeating... huge meal? Pour yourself a glass and take small sips. Helps out a lot. Has reduced burping and bubbly belly symptoms for me. Will be a lifelong drinker of George’s! This product has done wonders for my family. Everything from heartburn to aiding in digestion as well as soothing EE. It is now a staple in our home. I tried to purchase a similar item at Trader Joe's, it didn't compare to this product. You're paying for quality. 5.0 - What a relief - for acid reflux, indigestion, heartburn - and hair loss? 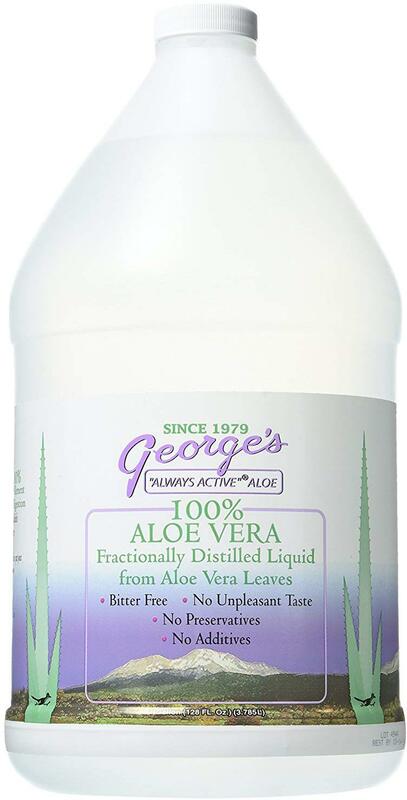 I have been drinking George's Aloe for almost a year now & have significantly reduced my dependence on Nexium for heartburn, reflux, indigestion. I have been on Nexium for 5+ years & get a little concerned about taking it for so long, even though my gastroenterologist says it's fine. I have not been able to go one day without taking Nexium until I started drinking George's Aloe. A friend of mine heard about George's Aloe from her holistic pharmacist. George's Aloe has no taste or texture - it's like drinking water. I drink about 2 oz. every other day - the days I don't take Nexium. I love aloe water. After a stressful year I had problems with heartburn and acid reflux. I was taking otc pills daily and hated it. I started drinking a little shot glass full a day and could stop taking medication and had no more issues. 5.0 - Can't Go Wrong With George's! A friend turned me on to George's and I love it! I didn't believe that it had no flavor and was just like water but it's true! It gets rid of my heartburn, sour stomach, nausea - pretty much any digestive issue I have. I recommend to anyone with similar issues! If you take on the regular then you wont even have those issues! I got this for bad heartburn which i get everyday thru out the day.....I eat well so dont know whats up but this does help sooth it most times however when it does not i take baking soda and water...This is good enough that i will continue to buy....I have gone thru 2 1/2 gallons this week already!Crazy !.....I will update later if it gets rid of it permanently. I have heartburn troubles from time to time and was looking for an alternative to medication. I have tried other aloe products and was looking for one I could get for a better price. I love this stuff. The taste is almost like water, not strong at all and keeps me free of indigestion, heartburn, etc. I am not real good a drinking a little everyday, so when I have problems, I will drink half a cup or put it in my water to drink all day. This product is great and will help to clean your system too. Two stars for great taste (like water), but had no effect on my pregnancy induced heartburn as it claimed. Good stuff. Great for healing the burn in heartburn. My husband felt change overnight. No more heartburn and bubble gut. Doesn't taste bad. More importantly, we (wife and I) haven't been troubled by heartburn since using it. I'm in healthcare and was skeptical, but am very impressed by the results we've seen. I tried this product to releave my heartburn symptoms as nothing else seem to work. After drinking it for about 3 weeks my heartburn was gone. I have been drinking this for over a year now. Some days I have mild heartburn but for the most I am heartburn free. If you have this problem, I would recommend trying it. Was having severe Heartburn and am on Nexium daily and have been for nearly 30 years now. I read all of the reviews on this and decided to try it. It is like water with a bit of an after taste but not a bad one. It really has made a difference for me. I'm almost to the half way gone point now and have really noticed a difference in my heartburn. It took about a week for it to be gone almost completely. I had a little break through but it was lessening by the day. Like I said the gallon is almost half gone and I'm thankfully feeling the relief. I keep mine in the refridgerator but it says you don't have to. I like it better that way. I drink two ounces first thing in the morning and again when I get home from work. I'm very happy with my results, especially with absolutely NO side effects! 5.0 - This is for heartburn, stomach, pancreas, and to drink for health!!! Excellent, this stuff makes life easy and Aloe Vera is pure here (but they took the bitter taste out) and I know some people with terrible diseases that it has helped. You cannot say much more because you can get sued but this, with 19 other herbs and vitamins a day, make us healthy, wealthy, and happy! My naturopath suggested this specific brand of Aloe supplement. It is completely tasteless! Tastes just like water and I am REALLY sensitive to taste and smell. I take an ounce of this 2x/day to help coat my stomach while taking other supplements to increase my stomach acid. Before taking this...the bitters supplements and acids made my stomach feel queasy and nauseous. I also got heartburn. If I take this before hand though..all good. Stomach is completely fine taking the other supplements. Highly recommend! I am really pleased with this product. I've tried other aloe liquids and the taste is hard to deal with. George's Aloe has no taste at all. It can be added to other liquids but is fine on it's own. I have been taking it twice daily for digestive disorders (heartburn,etc. )and have found a marked improvement. I whole-heartedly recommend George's Aloe for anyone interested in taking an aloe product. Worked to relieve my heartburn/reflux. Had to take it for a few days. BUT..I recently found out that I was hypokalemic (low blood potassium) which I've never really had before. Further research showed that glycyrrhizin reduces your potassium levels. This product is de-glycyrrhizined BUT if you read the label there is less than 1% glycyrrhizin per tab, which can add up if you take 3 tabs/day for several days. I'd recommend upping your potassium intake while taking this product just to be safe. I don't need it anymore as it resolved my chronic gerd/heartburn (I also stopped eating super fatty/fried foods). FYI, I bought this product in a health food store, not Amazon. Just wanted to inform others of my experience. Most Americans need to know about this product! It is the best and safest cure of indigestion or heart burn. 5.0 - Great product at a great price! Been using DGL Ultra - the BEST-tasking DGL on the market - for a few years now. This one is fresh - expires two years from now - arrived fast, and is inexpensive. That's what I was looking for! As far as the product goes, for those with heartburn issues - worn out stomach lining from years of...whatever...heartburn, hiatal hernia, etc. - chew one tablet before each meal. That's it. Doesn't do as well when taken all at once or between meals. Takes a few days to see the full effect. Your body will rebuild its stomach lining in about 3 days. THIS seems to help! I weened myself off famotidine tablets. Of course, you have to follow a non-heartburn diet and check with your physician. There's a mild 'coating' effect when taken before meals which helps reduce heartburn. Excellent product...tastes great! German chocolate is the best of their flavors! it's only 1 gram of sugar - fructose-based - so ...no worries! I do not use the 'non-fructose' products by Enzymatic Therapy because they contain malitol and sorbitol...and you know the rest. I purchased this at the beginning of the year and it was terrific. It tasted great and worked like a charm whenever I had some slight heartburn. The new formulation makes my mouth burn and tastes terrible. I'm so disappointed. This stuff really works! Take it 20 minutes before a meal and I get al let no heartburn. 5.0 - Delicious! They stop indigestion and heartburn immediately! Now and then I need a tums or other antacid after a particularly heavy or greasy meal (onion rings or BBQ ribs!). I decided to try these as an alternative. They not only work great, but taste good too. No artificial colors either! I have GERD really bad. My doctor put me on Prilosec. The Prilosec helped a little, but I was still having horrible heartburn and I was having side effects. I knew my doctor would put me on another PPI, which I didn't want, so in desperation, I started researching natural remedies and read about DGL. I figured I had nothing to lose, so I ordered a bottle. After a couple of days taking the DGL, my GERD symptoms vanished. I stopped taking the Prilosec and now just take the DGL before meals. I feel much better than I did on the Prilosec. The chocolate flavor isn't bad. The flavor and texture reminds me of the chocolate freeze dried astronaut ice cream. I hate licorice and can not taste it at all. DGL German Chocolate tabs taste great! It works but obviously not as good as omeprezole. However, taking omeprezole long-term has risk (as doctors and others have noted), so this makes more sense. One still has to be careful what they eat (don't eat trigger foods that cause acid reflex) even while taking DGL. Also, even with DGL, there may be occasional heartburn, etc.. but I think a few minor episodes are not going to cause damage. I never get heartburns anymore and not to mention, I've been off PPIs for 2 months now. Life is great! Although I did use L-Glutamine, Probiotics, Digestive Enzymes to heal whatever the hell was wrong with my system. 5.0 - Best product for heartburn I have ever tried. This REALLY helps my heartburn, especially in the evening. I don't want to be without it. 4.0 - Seemed to settle my stomach on occasional usage. I recently started having problems with heartburn and was given a prescription to take. After taking that for 6 months, I started reading about the prescription acid reducer studies that have come out, warning of the risk of long term use. I then started looking for alternatives. I had seen on Dr. Oz about the DGL, and thought I would give it a go. I stopped the prescription meds and started using these, taking 2-3 a day. I thought it was doing really great, but after about 2 months, I started having problems again, and I'm back on the prescription. I am still looking for alternatives, and do use this on occasion, if I have an upset stomach, and it seems to help calm my tummy for those times. Overall, I would say it's worth a try, I had not adverse affects, it just didn't take care of what I needed it for!! This stuff is the sure fire way that my husband can get rid of heartburn quickly. Nothing else works nearly as well. Very impressed! I've been taking this 20 minutes before meals for about 2 weeks now. The first time I took it I felt some cramping pain in my stomach. The second time I took it I felt some stomach discomfort but not too bad. Ever since then I haven't had any of the cramping. I notice that already I don't get a burning feeling in my stomach when I've waited too long to eat. I'm really hopeful this will help heal the lining of my stomach because lately anything acidic like tomato sauce, tea, and even some fruits burn my stomach. My only problem is about 10-20 minutes after meals when I take this first I get gas pains in my upper ribcage area, right underneath my breasts. This only started after I began taking this DGL and doesn't occur when I skip taking it. I'm not sure what causes this, possibly the sugar or milk in the tablets? I'm still going to take it to see if I can finally return to eating "normal" food again, but once this bottle is done I'll probably try a sugar/dairy free formula. These chewables work great for occasional heartburn. I was able to stop using other heartburn medicines when I found DGL Ultra! They taste much better than traditional heartburn chews too, so that's a bonus! Helps heartburn as soon as you take it. This is an amazing product. I used to get heartburn and sour stomach all the time. Then I started using this every day. Now I don't even need to use this all the time, just once in a while. It tastes really good too. I get extreme heartburn and it helps but does not take care of it completely. The only thing that keeps my heartburn at bay. 5.0 - Works very well for suppressing GERD symptoms, but not necessarily a cure!!! This product is very effective in suppressing GERD symptoms, but is not a cure for the root cause. I have suffered from "GERD" for over 4 years now. The Air Force started me on Prevacid after mentioning the word "heartburn", and then switched me to Nexium later. When I got out in 2008, I started buying Prilosec OTC. Then Prevacid OTC came out and I started taking that because it seemed to work the best at suppressing my heartburn. I used to use Prilosec until I discovered this natural remedy for heartburn. 5.0 - CAN'T LIVE WITHOUT IT! 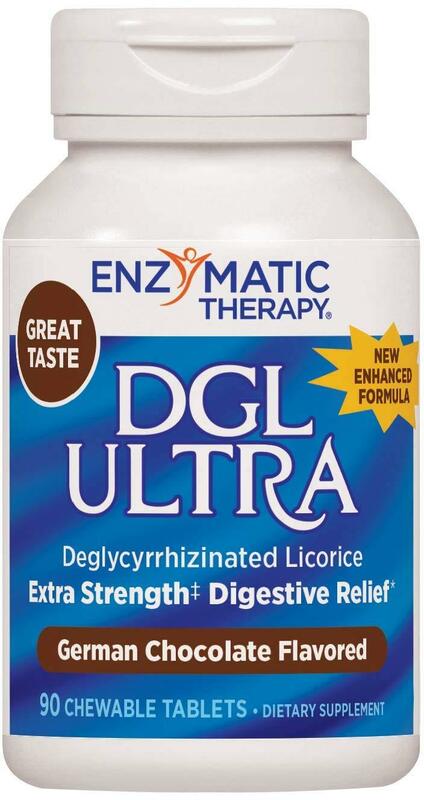 The DGL Ultra-German Chocolate Enzymatic Therapy works wonders on my stomach in just a few short minutes. It's the best I've found that really work for an upset stomach or heartburn. I have almost constant heartburn that started about six weeks ago after I took antibiotics for a bacterial infection caused by a cat bite. I have been using these tablets before breakfast and dinner, and again before I go to bed. The taste is OK, chocolate with a hint of coconut, but they don't seen to be helping me. I am really disappointed because this heartburn is making my life miserable, and I had high hopes for this product. It does what it is supposed to do if taken as described--stop heartburn/acid reflux. This is really a quick way to get rid of heartburn. The taste is not quite as good as real black licorice, but it helps, so I don't mind. 5.0 - This is the best stuff for heartburn! Take this stuff for heartburn. Get off the meds, and take two of these when you need them. They really do work! 56yrs young but with constant heartburn. Started taking DGL in November - no heartburn since. Natural Factors works for me and this price is very competitive. Taken before meals, this DGL sure seems to reduce heartburn and other digestive problems. If you are prone to acid reflux and have it under control, in many cases the problem is not gone. Your stomach still makes fumes (for lack of a better image) that rise and cause a dry cough. This DGL will stop that within a week. Chew one (not two) half hour or so before a meal or an hour or two after a meal, if you want. If I use two at once (I like the taste) I will get heartburn from the DGL, but never from just one. Chew it to liquid and swallow the juice with a little water if necessary. I feel a relaxing feeling in my throat and gut when I use this. DGL has a mild licorice flavor. I've just started taking these, so I can't say how well they'll do in the long run, but so far they do seem to help me. I was on Nexium for many years and wanted to get off of them and try something natural, so I'm trying this. They are pleasant tasting and I've only had a few bouts of severe heartburn (and that was when lying down after eating something very acidic) I'd recommend them. 5.0 - Finally...help with reflux and no side effects! I've been having problems with reflux for years. My most irritating symptom was constantly clearing my throat but I also was to the point where I was having heartburn daily. After trying lots of different PPIs over the years with no success, I decided to try Prevacid (my doctor said it worked better than some of the others). He was right...within a week my throat clearing was greatly reduced and I rarely had heartburn. He said I could continue to take the Prevacid after the recommended 14 day period, if it helped. After about a month on Prevacid, I started having stomach cramps and diarrhea every day. I didn't have reflux but I couldn't leave the house without being in fear if I wasn't near a restroom. After researching the side effects and finding that acid blockers/reducers can cause this side effect, I had to stop the Prevacid. The IBS symptoms were gone in a few days but the reflux was back, at least the throat clearing was. I found info about DGL while reading a message board about the side effects of Prevacid. One of the posters mentioned he started using DGL and his symptoms cleared up. So I decided I had nothing to lose and gave it a try. I'm so happy I did! I just started taking the DGL about a week ago but I've definitely noticed a difference. However, with the recommended one tablet before each meal, I didn't notice much of a change. But now I chew two tablets before each meal and it works like a charm. The throat clearing has decreased by about 90% and no heartburn. As for the taste, I was expecting the most horrible taste, based on some of the reviews, but I don't think they're bad at all. If you like black licorice, you won't have a problem...to me, they just have a mild black licorice taste and you get that licorice after taste but it is definitely not bad. I haven't tried any other brands so I don't know how the taste compares. Bottom line, if you have heartburn or reflux and you don't want to take medication, give these a try! This product has eliminated by daily heartburn, so glad! The taste is not great, but it works! Now I only take it once in a while. I had to use literally twice the amount of these, compared to other brands, just to keep up with my heartburn. I am trying out multiple brands hoping to find a good flavor I can stand. I can not recommend this brand due to it's severe lack of potency compared to other brands. I plan to update this review and add to all the other dgl brands after my journey is complete. Works great and helps repair the lining of the stomach over time. It also relieves indigestion and heartburn and works in minutes AND it's all natural. What could be better? It's also very affordable! This product is highly effective at reducing acid reflux and heartburn when used regularly. It is not an antacid, and won't help much in stopping a current bout of hearburn. I have seen other reviewers complain about the taste but I have tried some of the competing products, and they taste worse. Now that I've gotten used to it, I don't mind the taste at all. I think it helps some but not convinced it will stop heartburn altogether if taken before a meal. Jury is still out. 5.0 - Heartburn for 10 years, cured! Better than perscription! I have had heartburn and GERD for YEARS! Ive tried every OTC, been perscribed Nexium, Prevacid, Omaprazole, and nothing has worked as great as these tablets! Also had side effects! They took a bit of getting used to the taste, but now I actually like it. My neighbor gave me half a bottle to try out and they worked so well I bought more. I recommend them to everyone I know. I feel they really repair any heartburn damage I may have had, and my heartburn has decreased tremendously to the point I can eat spicy foods (within reason) and have little to no heartburn. 5.0 - Exactly as advertised! I was experiencing heartburn frequently and didn't want to take OTC meds, my sister told me about DGL. I have found instant relief and like the taste. However, you need to be a black licorice lover! I am ready to order my second bottle, I used about 3-4 per day initially but now only need it 1-2 to do the job. Completely cured my heartburn after taking them for only a few days. I now take a couple of tablets a day and the heartburn has stayed away. Much safer than taking a prescription drug for heartburn. I didn't even know a product like this existed until recently when a friend said he was now taking it for heartburn and it was great. I found out what he was talking about, write it down, and that evening when we were done playing cards I headed straight to my computer and ordered some. The day they arrived. after twp doses, I ordered again, a much larger bottler. Really, this is the way to go. I have tried several different brands of DGL Licorice, and this is the worst tasting one of all. Do try another brand, though, as it has helped me with my acid reflux and heartburn. It is much better for your body than acid suppressing drugs. These have been great for my stomach ulcer, especially taken before eating. They also help with heartburn/acid reflux! 5.0 - Best Heartburn Remedy Found! 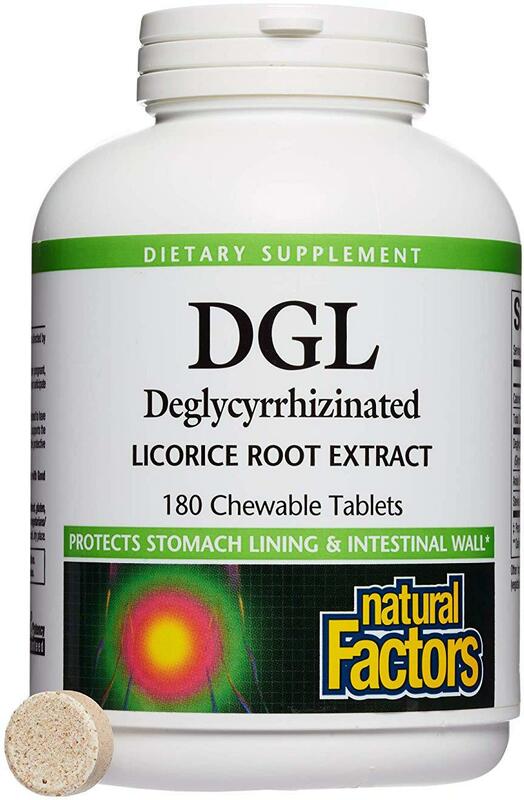 With DGL licorice I was able to throw away my over the counter heartburn remedies, which I'd been dependent on for 10 years! The bad part about DGL is the taste, but this brand is the best tasting of all the brands I've tried. Some were downright intolerable, but this brand is good and very effective on heartburn! I recommend taking three a day while cutting down on your other heartburn meds until you're off them, then once or twice a day to keep the heartburn away forever! Love this product. 5.0 - Take 2 As Needed for Heartburn! These seem to work when you have heartburn, or any kind of burning in the esophagus to the stomach, which I have. I don't like taking tums or maalox, etc, which are not natural and do I-don't-know-what to your stomach. I do know that this has a efficacious effect on the stomach while taking the burn away. It says to take one three times a day, but I take 2 as needed and it works fine. Tastes a little bit like licorice, but without the bite, also tastes a bit like chocolate. Certainly not an unpleasant taste! Tums, Maalox, Pepto, Rolaids never really worked for mild nausea and heartburn. I chew a couple of these as soon as I get up in the morning and they take the edge off until my Nexium and Reglan kick in. I have heartburn and digestive issues and these tablets work very well in helping me digest my food, as well alleviating some pf the heartburn I'd suffer from the food I'd eat. Recommended! 5.0 - DGL is awesome! DGL is something I have used for years and years and depend on it to keep acid burns away! Being extremely sensitive to any acids, I have had gastritis (acid burns in the stomach) quite a few times and it can be extremely painful and uncomfortable. They work as preventive to take before meals or acid foods (or coffee) but also work to ease heartburn. The active ingredient is more effective for me than prescription medications and over the counter antacids and surely more healthy to use. I also like the caramel flavored ones almost better than the chocolate. When I started using DGL, the lozenges were only available in the licorice flavor (the active ingredient comes from licorice) and it's very nice to have the chocolate and caramel flavors which are best although caramel does not come in a sugar free formula. Made my stomach nauseous each time I tried this product, plus I still got heartburn. I've been using this product for at least 5-6 years, always carrying some in my purse in case acid stomach or heartburn arises. I've always used the Sugar-Free German Chocolate flavor. It has always had a very good taste and has worked wonders for me. I have to agree with the reviewer who recently said she almost spit it out. That was my exact same reaction. The taste is so bitter now and it lingers in my mouth even after drinking water. There is no way I am buying this again. I don't like the taste of licorice so I gave up on chewables and ordered the Nutrissence capsules. Probably better to do without the artificial sweeteners anyway. Unfortunately right after I received this product and took the first dose my heartburn decided to go away. So have only taken one dose. It does taste very yummy, imho. This product has replaced any prescriptions and/or OTC medications I had been taking. It really works! 5.0 - Yummy in your tummy! This is a great product both in taste and function. I was referred to this product when I decided to try to stop taking the acid reducing medication that I had been taking daily for the last 12 years. In combination with a gluten free diet, this DGL has made it happen! It's not quite as effective as an antacid on acute indigestion or heartburn but so much healthier for you. Plus, it tastes great! 5.0 - IT REALLY WORKS FOR INDIGESTION! One of the best and effective “over the counter” products to relieve heartburn and because it comes in flavors; it is tasty to chew. This product absolutely did control the GERD. However, it caused my blood pressure to rise which is unacceptable to me as I typically have no blood pressure problems. So I ended up stopping this product. I did not notice any difference with bloating or bowel function, though, only heartburn/GERD. 5.0 - I Seem Cured! I have been fighting heartburn with 8-10 TUMS a day for about 5 years now. I never actually experienced acid reflux until recently. I started getting acid reflux in my sleep and inhaling it and choking. Prilosac didn't work for me because I would forget to take them until the pain came back, and Zantacs never worked as good and fast as TUMS. But TUMS were'nt working that well any more, and the new experience of acid reflux in my sleep scared me. I saw an article about about DGL and tried it. I took three 400mg tabs a day for about two weeks. I also took a cheap probiotic aftr eating big meals. After about two weeks my heartburn was completely gone. I haven't taken anything in about a week now. I've had no heartburn and no acid reflux episodes. So you don't have to take the stuff forever. I have tried everything for reflux, this product really provides relief for heartburn, in the worst of the cases for a few hours at least. 5.0 - Keeps the stomach squeeze away with a managable taste. Purchased more that once. Helps me with heartburn. I couldn't handle the licorice flavor, but this certainly works for me. Would recommend if you have GERD as it really does help that indigestion/heartburn and fairly quickly too. 5.0 - Really do help with heartburn and stomach upset! Not sure how this works but it does! I was having a problem with recurring indigestion and heartburn so thought I'd give these a try. They really do work to a) prevent heartburn and upset if taken before a meal, and b) quell heartburn even if taken after it starts. Ideally of course I'd avoid food that upsets my stomach! But when I mess up, it's good to have these around to help me feel better. Really good for occasional heartburn. This medicine starts working almost immediately. I have been using this for a couple years and it really helps with my heartburn! I had high hopes after reading all the positive reviews. I've been using Prevacid for about 2 years and really wanted to wean myself off of it. While this product helped somewhat, I still have mild to moderate heartburn. I think I may try another brand. I've tried the fructose free and the regular German chocolate. The fructose free had a somewhat unpleasant aftertaste for me. Some reviewers described the flavor as "yummy." While the flavor isn't horrible, let's not get carried away. It is not exactly like eating Godiva chocolates. It works OK, but I was dissapointed. I think Tums works much better! I might order it agaain in the future! This stuff is awesome for preventing and treating heartburn! 5.0 - Taken as directed gives great reduction in heartburn and burping. Taken as directed gives great reduction in heartburn and burping. Used to get off Rx heartburn drug. There were days this saved my life/sanity stopping those P.P.I.s. Tastes like yummy German Chocolate Cake. These pills are a miracle cure for my heartburn, which got very bad after my gall bladder was removed a few years back. My doctor told me to take a prescription medication to get rid of it, but I prefer to try natural remedies. Now that I've found these licorice pills, I no longer need to take prescription medication for heartburn. When I feel it coming on, I take 1 pill and it cures it almost instantly. The chocolate ones have a nice taste and a pleasant texture. They do not taste like licorice at all. Highly recommend trying them if you are currently taking a prescription or OTC heartburn medicine. I was having some bad post-op digestive issues after gallbladder surgery, which included heartburn. This product seems to have worked and kept this symptom at bay. They taste great and are easy to get down, (chewable). These worked great at stopping heartburn. I was able to get off ppi's using these. I recently read an article that eating cayenne pepper will help to burn excess fat from your diet. However, I do not enjoy eating spicy foods because of the negative effects it has on my digestive system. After a bit of research, decided to purchased Nature's Way Cayenne 40,000 H.U. (Heat Units) 450 mg. which is equal to HOT. Nature's Way also offers a 100,000 H.U. Extra Hot Cayenne for those not afraid of the spice. The container recommends taking 1 capsule three times per day with food but I was cautious and started with one per day. The label offers a caution that "if you suffer from heartburn, hiatal hernia, gastritis or puptic ucer disease, please consult your healthcare professional before using this product". After a few days, my roseca flaired up with a noticeable blister on my nose and a bit of indigestion appeared. I stopped taking the product until the sytems were gone and now take them in moderation following a fatty meal and have not had any difficulties. The product does make you feel "invigorated" as claimed but use caution when taking. It gave me such bad heartburn that I couldn't use the product. I'm not usually that sensitive so I was surprised. They don't tell you this information when they are trying to sell you on the product. It gave me heartburn so I had to quit taking it! Waste of money! Gave me heartburn super bad! I did noticed weight loss while on this product. Keep in mind I was also watching my intake. It gives you a warm feeling quickly after taking it. My mother took it as well and said it gave her heartburn. (I'm not a doctor) Embarrassing to talk about, but this product works wonders for hemorrhoids in conjunction with apple cider vinegar diluted with water applied topically. Let me be clear. This product is to be used orally and vinegar topically. Don't want to mix that up! Especially good to stop bleeding! Side effects include heart burn, especially when taken later in the evening. If you already have heartburn, I would probably avoid these pills! Also, seems to be a strong thermogenic. So, it will make you feel really hot sometimes, especially when you first take it. I'm a little less sure of its effects on your metabolism, but thats really hard to judge accurately. I got what I ordered and exactly what I expected...but through no fault of the seller...it gives me heartburn. Now, I am of hispanic descent and rarely do I ever, and I mean ever, get heart burn! Great product, but it's best to take with food to prevent heartburn/burning in stomach and any other side effects. Also even better you should prep your stomach that cayenne is on the way by sprinkling some cayenne on your food so your stomach gets warning and can prime itself rather than having a capsule of cayenne suddenly open up in your stomach unexpectedly which is not a natural thing to happen . I take cayenne supplements once a day with food to boost my metabolism and to help with blood circulation. The amount of product you get for the price cannot be beat in stores. It does tend to take a while to adjust to the warm sensation and I don't feel it as intensely every time I take it. I do sometimes get heartburn from it but if you drink it with some milk it may help. I will definitely purchase again! I purchased this hoping it would help with burning a few more calories while I workout and try to lose weight. While taking it I got mild heartburn which was alleviated by taking it with food. It won't help you lose weight too much, as there isn't that much capsaicin in it, and even if there was the metabolic boost is minimal. I gave it 4 stars since it good cayenne, but it's not good for much other than seasoning. When the label said it could cause heartburn it wasn't kidding. As soon as I took these pills my stomach burned all day so I had to stop taking them. 5.0 - Did someone say winter? I had to start out with 1 a day with food. After about a week, 2 a day. A month later and i take 3 a day. This will light your insides up like fire. Must take with food and do not take if you have heartburn. The more active you are tye more you will feel the burn. I started taking these a week ago and I love them. They really help my circulation, and I haven't had heartburn or anything like that. Friend recommended to take to assist in weight loss. I am not sure if it is from the cayenne or not but I truly feel the burn when I am working out and can run farther in better time. No aftertaste (other than the initial plastic capsule taste) but if you are prone to heartburn or indigestion I would not recommend taking more than 1 capsule per meal. All in all, good cayenne capsules for whatever you use them for. 1.0 - Totally useless and woefully ineffective - except for the heartburn and nausea. I really am confused by all the glowing reviews in regard to this product. After a month of recommended use, I found this to be completely useless and totally ineffective. The only noticeable effect was the subsequent heartburn and nausea induced by the Cayenne Pepper (what insanity is this)? In certain instances, the nausea was rather severe. Let's also note that this is woefully under-dosed. 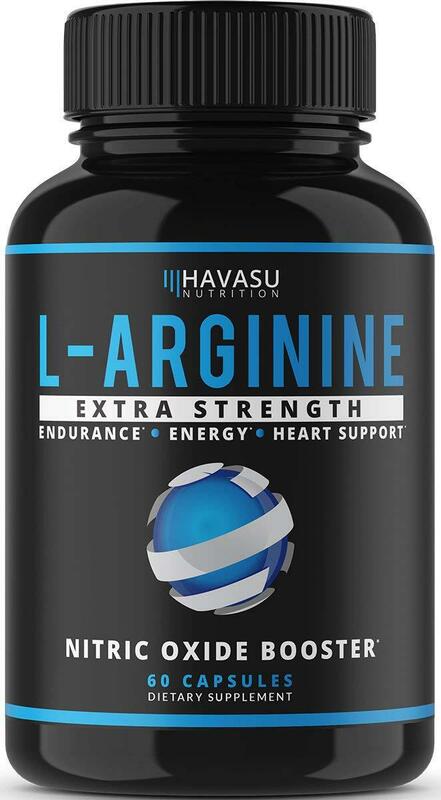 Current science suggests that L-Arginine is effective at approximately 3-5g per serving. This is nowhere near that. Let's also note that this appears to be 800mg of L-Arginine + 400mg of L-Citrulline, which the body converts to L-Arginine. So, the 1200mg of L-Arginine is not really true. I tend to use L-Arginine as part of my pre-workout regimen - with the expectation of various acute effects (the "pump" that is commonly referred to). This supplement provides none of that - even at double the recommended dose. If you compare to other L-Arginine supplements, you'll find that this one is relatively expensive for what you are actually getting - forgetting the horrid side effects from the inexplicable inclusion of the Cayenne gut-bomb. Something like the SHEER N.O. Nitric Oxide Supplement smokes this supplement 8 ways of Friday. While it looks more expensive, you get far more bang for the buck. Do yourself and compare the product labels. The difference is remarkable and obviates what a rip-off this product actually is. 4.0 - No noticeable effect after 2+ weeks. The only noticeable effect I had from taken this product was mild heartburn about every other dose. I didn't notice anything else...no increase in energy, no change in BP, nothing. These pills gave me immediate heartburn every time I took one. It was so unpleasant that I wound up throwing the rest of the bottle away. I didn’t see anyone else with this problem, however I had severe heartburn. this gave me terrible heartburn, so I stopped taking it after a few days.. I am using a different brand now that my body seems to tolerate better. I got heartburn after taking it just for a few days. I felt better but had to stop taking it. Probably the cayenne pepper. I'll try another brand without cayenne. To those of you complaining about heart burn...READ THE INSTRUCTIONS (take with food). Just for giggles, after reading those, I took it on an empty stomach - yes immediate heartburn (well, 10 min anyway). Now, I take with a handfull of nuts or a protein bar, and I never noticed after the first dose. If you are already using a nitric booster and you come here for the price, or aren't in that 55+ age group, this is NOT for you. I have previously used sheer strength nitric booster for over a year and that setup works best for me. I feel when I take these pills a sense of heartburn when I workout. They just aren't good pills. I'm going back to sheer strength. The price of these pills may fool you to try, but just stay away. 5.0 - DEFINATELY IMPROVED MY BLOODFLOW! This product works. I have tried other L-Arginine supplements but this is the one that makes itself more prevalent in my workouts and everyday physical activities. It is a subtle improvement so don't think it will be earth shattering. I will say that the cayenne pepper yields a side effect of heart burn if not taken with food. The health benefits of cayenne pepper more than outweigh the minimal risk of heartburn. I would also consider taking with food to prevent the pepper from inflaming or aggravating the stomach lining! I take it the same way I take my multivitamins, with a banana or oatmeal and 12 ounces of water. This is the best L-Arginine supplement I have found and will continue to use it. Causes severe heartburn could not continue taking after one dose!! 5.0 - Try this for fatigue! 2.0 - Works well... but heartburn! Works well. However the Cayenne pepper will give you heartburn. I didn't feel like this was any "cooler" at all in my stomach. Still got lots of heartburn, and a hot exit as well. I have used this over the course of two weeks along with diet and exercise and have lost three pounds! As a heartburn sufferer I was weary over this product but the "cool" technology did not disappoint! I bought this to take before bed in order to help with my allergies. My nose often smells the minute I lay down. I find that most nights it works nicely in helping me to breath and it doesn't cause heartburn. 5.0 - Bought to avoid heartburn and I don't have heartburn! I purchased the Cool Cayenne pills because regular cayenne gives me heartburn. I haven't had any trouble with these and will be a repeat purchaser. To think for years I suffered through burning stomach pain to get my daily dose of cayenne before I found these beautiful gems! This is such an amazing product and I no longer have to suffer through heartburn and stomach discomfort to reap the benefits of cayenne pepper. The 180 count bottle is very reasonably priced and lasts a long time. The capsules are very easy to swallow and they have greatly helped to reduce my headaches and blood pressure. I'll be back for more! I'm not sure how I feel about these. I do know I can't follow the recommended dosage...HEARTBURN!!! Therefore I can't or won't take them regularly. I was recommended by my Pastor to take this because I have stomach problems. This stuff made me worse. It burned so bad in my stomach and gave me very bad heartburn causing me to vomit while I was sleeping. 5.0 - Oh, yes you Can take Cayenne! I was scared to death to start Cayenne capsules. It is very difficult (if not impossible to find a Cayenne capsule with less than 40,000 HU "Heating Units") Reading reviews before purchasing this product almost made me forget the benefits of Cayenne and go without. I saw another Cayenne product with a cooling agent - ginger, but people were still telling horror stories of intolerable heartburn. I weigh less than 100 pounds, so I thought there was No Way for me to take cayenne. Just as I was giving up & logging off I saw this product by Solaray. One of the reviewers stated that her ailing husband in his mid 70's was able to take 4 a day with no problem. Yay! I ordered them & have had No ill effect what so ever! It is true what they say about Cayenne. It is Super Duper beneficial. Yes, this product does cost about 3 times as much as plain Cayenne pills but had I bought the regular Cayenne capsules or the other brand with "cool" they would have ended up in the trash. I will keep taking this cayenne for the rest of my life, because my health has improved because of them. I have a sensitive stomach, and other cayenne products gave me heartburn or upset my stomach. This product didn't bother my stomach at all. 5.0 - Does Not cause heartburn! This cayenne is great. It does its cayenne-job (helps with arthritic joint pain), and, it does so withOut causing heartburn-pain instead! 5.0 - Great ulcer home remedy. It seemed to help with my ulcers, but it should be noted to take these in the morning with food or else you will have major heartburn all day. 4.0 - Cut the dose if you have side effects, but so far it works great for my allergies! This is an early review as I have only had this product for a few days. I bought these as I have been suffering fatigue, severe allergies and bronchial asthma since November, with the heavy rainfall in California this year, and I had read that cayenne can help alleviate these issues. 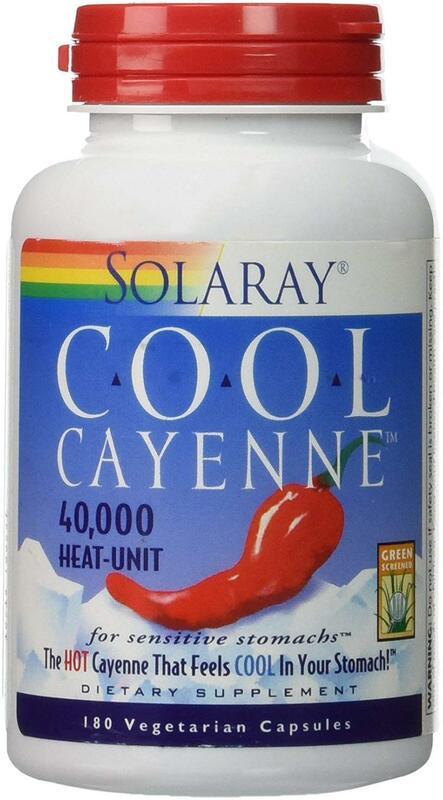 Important- if your stomach is sensitive like mine, there is nothing "cool" about this cayenne! I suggest cutting the dose in half while your system adjusts. The first day I took two capsules, and was pretty much in pain the entire day, burping cayenne constantly, burning stomach and heartburn; in spite of taking a meal with the capsules. The last 3 days I have taken only one capsule per day and the bad side effects are no longer noticeable. The good effects: my energy level has been through the roof the past few days and my allergies have improved dramatically. Placebo or cure, I don't know, but so far I am intrigued and will continue taking them. I see no need at the moment to increase the dose to the recommended 2 capsules, but if I do I will update my review. 5.0 - Cool Cayenne, how wonderful is that! I have been using Cayenne for several years and this is the first I have tried Cool Cayenne, and I will be continuing to use it after having had it now. Occasionally there will be time when I have a little heartburn from my activity too shortly after taking, but most of the time I don't even notice I took the at all as far as heartburn. They seem to be as potent as others I have taken and it sure helps to keep me warmer in the winter. Great product! 5.0 - Great alt for joint pains! Very good for joint pains. Did not cause heartburn. Beware of blood thinning effects if you're on thinners or scheduled for surgery. 3.0 - Holy Heartburn, Pepperman! I buy so much stuff from NOW, but this one has a capsule that's just too darn thin. Almost nothing gives me heartburn (and I eat plenty of spicy ethnic foods) but, hoo-boy, watch out for this one. The directions say to take it AFTER a meal, but if I were continuing with these I would take them BEFORE the meal so there's a pile of food on top. The problem is these capsules dissolve so quickly that the cayenne just sits there on top of your food in your stomach and it does not readily dissolve in your gastric juices. One time I burped ten minutes after taking my stack and - lemme just say I do not recommend coating your esophagus and nasal passage with 500mg of cayenne extract powder. I'll be looking for an enteric-coated cayenne next. I purchased this due to the health benefits of cayenne. This maybe a quality supplement however I could not stand the heartburn I got from taking this so I had to stop after the first few days. I discovered that when I ate a small amount of hot sauce each day, that my arthritis pain went away. I don't always eat foods that I would put hot sauce on, though. When that happens, I take one of these instead to get my capsaicin. I don't get heartburn from them when I stay upright for a while after taking it. The capsule are easy to swallow. I plan to order more when I need it. Medical research backs up fitness and health claims, but man is the heartburn unpleasant. Like to include extra Cayenne in our diet for heart/circulation health. Very helpful when the sinuses are blocked during cold season. Opens them right up. Good to have on hand for emegencies ie infarction or as a hemostatic agent. Just need to start slowly and work up to the suggested dose and take with food to avoid the heartburn. Now brand has just Cayenne and the gelatin cap. No stearate, silica, or any of those extra ingredients you don't need or want. Have been taking for about six months now… for metabolic boosting and cleansing, in lieu of mixing powder into a morning tonic. Easier to take and not as unpleasant. Drink lots of water when taking or it can cause heartburn. DEFINITELY take this on a full stomach, especially with a chunk of cheese. This is a rather heavy dose of potent cayenne pepper and severe heartburn will result if taken with an unprepared stomach. It will burn for hour. They warn about this on the label that they also sell a milder version. I'll be doing that next time. I have over 200 of these capsules left and might just throw them out ... or make a sadistic Tex/Mex chile. These have not worked for me. Only gives me heartburn. Just buy a bottle of Red Hot and it will do more than these capsules. If you take it on an empty stomach it can give you cheat discomfort like bad heartburn. Take it with food and it's not a problem. It will bump up your heart rate, so don't take it before bed or it can be hard to sleep. But before a work out and you will feel like you have more energy and in theory, you will burn more calories and build muscle faster. works well, but have apple cider vinegar, or a spoonful or packet of mustard nearby when it digests i sometimes gives heartburn b/c of the cayenne. Great product -- this works great on acid/heartburn -- just make sure to drink lots of water when taking. 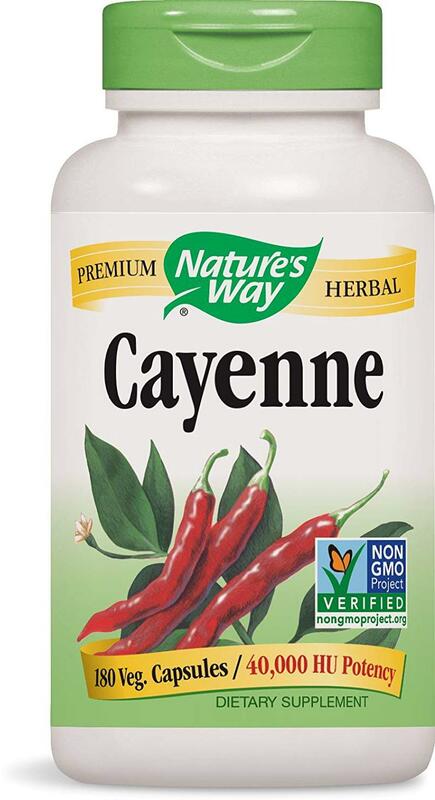 Cayenne has so many health benefits, and this brand is fantastic.